In the midst of a celebrated career that has taken place almost entirely behind the political curtain, Nancy-Ann DeParle was introduced to a microphone on Monday by the President of the United States on live television, and she almost turned it down. "Nancy, do you want to say a little something?" Obama asked her at the end of a ceremony in the East Room. "Go ahead." Her résumé is the kind that Presidents love to promote: Harvard Law, Rhodes Scholar, named in 1994 by TIME as one of "America's 50 Most Promising Leaders Under 40." She ran health services in her home state of Tennessee, worked in the Clinton White House on health policy in the early 1990s and oversaw the Medicare and Medicaid programs at that decade's end. Since then she has become a highly sought-after corporate, academic and foundation consultant, earning enough money with her husband, New York Times reporter Jason DeParle, to buy a $3 million house in the Washington suburbs in 2007. More important, DeParle is universally known in health-care-policy circles as one of the brightest minds of her generation. 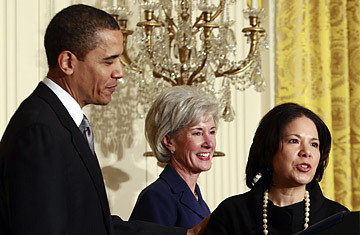 Obama now hopes that she is one of a select group who knows enough to make health reform happen this year. Her position, which is informally called White House health czar, was originally created as an add-on title for former Senate majority leader Tom Daschle, who had to withdraw from consideration for Health and Human Services Secretary because of tax problems. But with Daschle out, the White House decided that it still needed a high-level coordinator for the reform effort. "It's good to have someone who is really riding herd and only thinking of one thing," said one White House official. Although the responsibility is new for DeParle, the area of expertise is not. Back in 1993, when Hillary Clinton mounted an effort to reform health care, DeParle was at the Office of Management and Budget working on health-expenditure budget-crunching and statistical analysis. Her interest in managing and reforming Medicare and Medicaid has never really abated. "I don't know if you would say this is her second bite at the apple or if you would say this is a long-standing meal," jokes Chris Jennings, who served as Bill Clinton's chief health adviser. Under the ethics rules that Obama adopted in January, political appointees cannot "participate in any particular matter involving specific parties that is directly and substantially related to a former employer" for two years. A second White House official said on Monday that this rule would not prevent DeParle from doing her job. "She will recuse herself from what she needs to," the official said. "She does not need a waiver." The bigger question is how well she will be able to work with lawmakers, who are already well on their way developing plans to extend coverage and reduce health-care costs. But that job, like that of managing the internal White House deliberations, will place DeParle squarely in her comfort zone, not in front of television cameras but in backrooms wrestling with the extraordinarily complex details of remaking a broken health-delivery system. "We're going to get to work," announced Obama as soon as DeParle had finished her brief remarks on Monday. And then the new health czar walked away from the podium, through ornamented White House doors and out of the public eye.